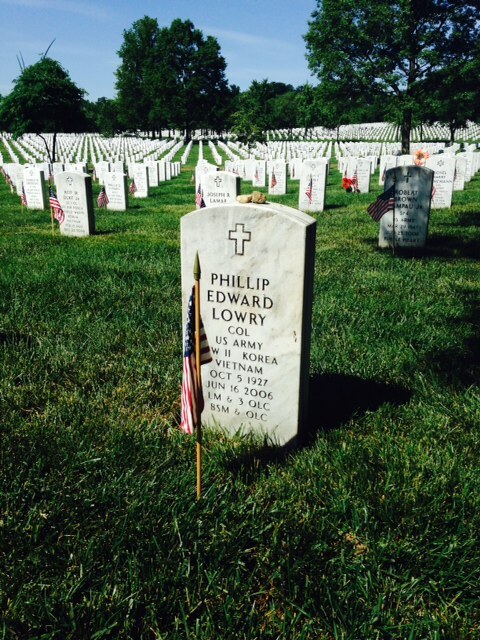 Yesterday I was making my pilgrimage to visit my dad buried in section 64 of Arlington National Cemetery. As I dodged the throngs of tourists and bikers paying their respects I was having a hard time keeping it together. Memorial Day is not a holiday for me and many other military family members. It is more like a holy day. It’s personal. It begins with my dad. After he came home twice from Vietnam we thought he dodged the mortars and bullets. Instead he succumbed to a weapon that stayed within and cruelly destroyed his marvelous brain. Agent Orange was a mighty force that crippled the enemy and so many of our soldiers as well. I sat and chatted with my dad as I am want to do. My mom will be interred with him sometime this fall and my visit there was a way to prepare for that next emotional event. I updated him as to the whereabouts of all the kids-I figure he already knows since he is watching over them anyway. Then I pulled myself together and decided to make my next stop-the Women’s Military Memorial. My mom was a charter member and it was fitting that I should update her record and visit the memorial she helped create. I was stopped in my tracks by this display out front. 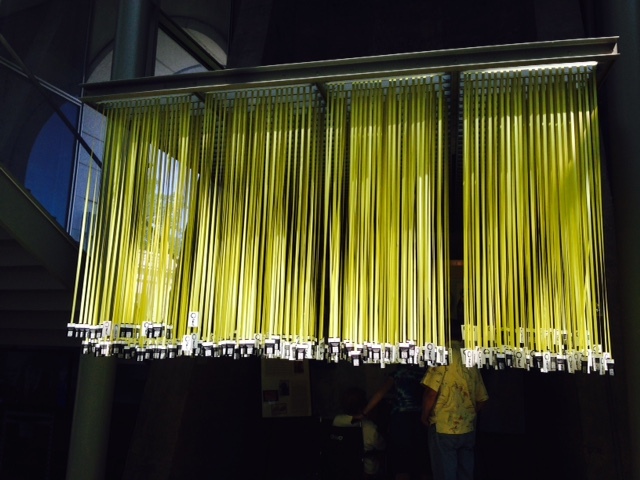 I was already an emotional mess as I made my way inside to see this display of 6,821 yellow ribbons hanging from the ceiling, one for every fallen warrior lost in Iraq and Afghanistan. And as I blubbered my story to a wonderful volunteer I realized this was not just about remembering, it was about honoring and healing too. How do we heal? It is a question we mommas are certainly looking for as we deal with the trauma of letting go and possibly losing our sons and daughters. When our children come home from service wounded in body and spirit and we cannot help them we grieve. And when we see our military sisters deal with the pain of unbearable loss it hurts our hearts. When we see warriors being honored and recognized is a huge step forward. I hope to blog more about using mindfulness as part of Holding Yourself Together in days to come as we strive to become stronger as our children become their best selves. 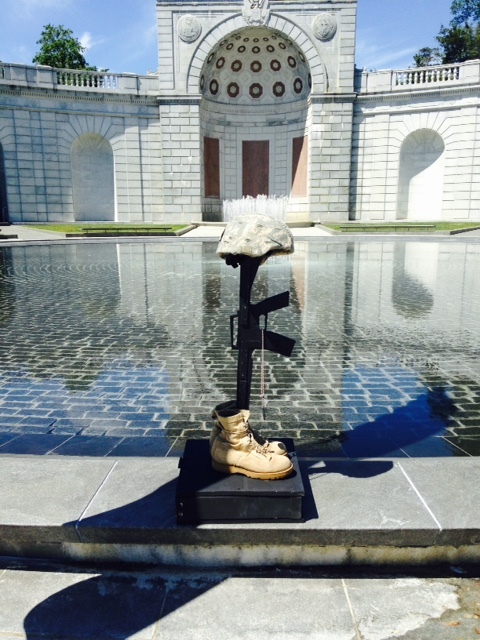 So what is Mindfully Honoring the Fallen? Mindfulness is giving something your full attention. Attendees to the memorial are given a ribbon to wear with one name and you are asked to a offer a mindful moment of gratitude in the Hall of Honor to honor that warrior. It was a beautiful experience to watch people solemnly accepting the yellow ribbons and prayerfully lift up that fallen warrior. As a momma I have felt the pain of so much loss by so many and the fear of potential loss. I saw the power of mindfulness in action as a healing force. It was a blessing to see so many honoring sacrifice in such a tangible way. Please go to the Mindful Memorial Day Facebook page to learn more about it and read the stories. 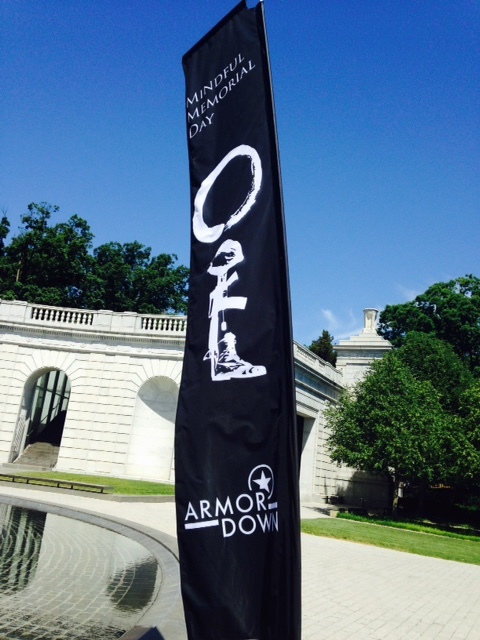 If you are visiting Arlington National Cemetery this weekend do not miss the exhibit. You will be blessed. Beautifully written. As a military Mom, you learn to live with the knowledge that one day that knock could come to your door. I have friends who’ve lost children, and walked alongside them as they grieve and learn how to live again. Since our nation began, so many have given their lives to her protection and in her service. Taking one day, as a nation, to remember and honor them, is a good thing. But they are in my heart every day. Thank you for writing this on such a personal level. We mothers let go and hold our breath that we don’t get that “knock” at our door, but know that some will. Tomorrow I will honor the memory of a friend of my son from high school KIA in Iraq 12/26/2006 as well as his mother who succumbed to her greif over this loss in 2010 and all the rest who sacrificed their tomorrows for our future – and will do so mindfully. I will be lifting them as well. I have been through alot in my short 42 years of life and thought I know what strength was. I was wrong. As I watched my son get on that white bus to go to boot camp that day I was heart broken and proud at the same time. That was 4 long years ago. As a mother we learn what strengths we have to keep our child calm in a time that they are upset. 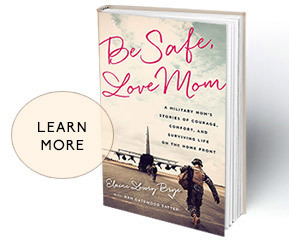 As a military mom we learn to keep our fears in lock down so we do not show our fears to our military child. We feel the mom instinct to stay calm and protect our child in any situation, but when I see my son again when he comes home, I know i will drop to my knees and thatnk the Lord that he is home and cry happy tears. That fear will briefly lift untill he goes back to his job and it starts all over again. I am so proud of him and greatful for all his brothers and sisters who stand by him everyday and fight for us to live so free. I hope they all come home safe. I have alot of relitives whom have served in the second World War and i am greatful for what they have done as well. This weekend I only wish I were there in DC to experience the Mindful Memorial and feel that same wave of Spirit that comes over you. I was able to go to DC on the 4th of July Last year and plan on going again soon. But until then I will continue to pray everyday for those still fighting and those we have lost. Elaine, you always know just the right thing to say or write. I am so proud to be a military mom along side of you. thank you this truly blessed my heart I am a mother of an Army EOD specialist deployment is upcoming. Godspeed. We are with you both. Thank you. As a MoM, mother of a Marine, I thank God each and every day that I receive a call or text from my son. I received the best mother’s day gift ever this year as that was the day he returned from a deployment. In a few short months he’ll be gearing up for another. I’m used to sleeping with my phone in hand and I find myself talking to him in my head every day. I also have a long list of prayers I say many times a day for him and all his brothers & sisters in arms. He is an amazing young man and I’m so incredibly proud of him. My only child, my son, my Marine. We are proud of him too. United in pride and prayer-sisters in service we are military moms. Elaine, I am so glad to have had the opportunity to meet you. Thank you so much for sharing your experience. Your writing fills my heart. Thank you. We mommas are hypervigilant too -these tools will really help us! Thank you for all you are doing. You get right to the heart of matters, as always, Elaine. Thank you for writing so eloquently for military mommas, and for those of us mommas (and papas) who are nonmilitary, too. I’m holding both of your brave parents in my thoughts. You have a gift to write and convey feelingsanybof us experience on Memorial Day. I very much enjoyed your book, it captured so many emotions I have been through. My thoughts are with you regarding your mom. Thank you. I appreciated your blog post as well.